He founded the Young People’s Chorus of New York City in 1988, using music to bring together children of different racial, religious, and economic backgrounds. They bond by working for common artistic goals and, together, produce startlingly polished performances. Franciso J. Núñez leads a recent class of the YPC, 2017. 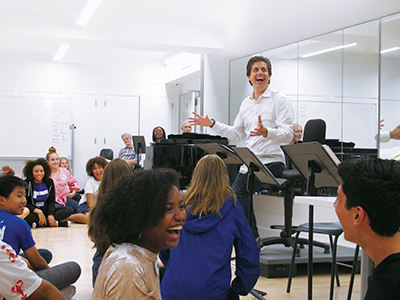 Francisco J. Núñez, the founder and artistic director of the Young People’s Chorus of New York City, likes to tell a story about one of the 1,600 choristers, between the ages of 7 and 18, who sing with his group—a tough, streetwise kid named Teresa, who typically arrived at rehearsals wearing headphones pumping out what Núñez describes as “really violent rap music—you know, with curses and about killing.” After the group rehearsed a piece written for it by Elena Kats-Chernin, Teresa walked over to the composer and thanked her for writing the piece, adding that she enjoyed it, even though she didn’t like classical music. The Young People’s Chorus of New York City, which Núñez founded in 1988, and is now a complex structure of after-school programs, in-school choirs, and community choruses, is not meant to transform young rap fans into classical-music listeners, but it happens. Nor is it meant to make them new-music proponents, but that happens too, thanks to the choir's Transient Glory and Radio Radiance programs, through which it has commissioned nearly 100 works from composers like Michael Gordon, Derek Bermel, Mason Bates, Charles Wuorinen, John Corigliano, and Meredith Monk. For Núñez, the choir is not even primarily about great choral singing, although when you hear its startlingly polished performances, you might assume that Núñez’s goal in life was to be the Robert Shaw of the pre-college set. Núñez, 52, grew up in Washington Heights, a Dominican neighborhood in upper Manhattan, with little money. His father died when he was 14, and his mother found him a piano teacher, mainly as a way to prevent him from becoming involved with the street-hardened neighborhood kids. As a teenager, he also took a job as organist and choirmaster at the Church of Our Lady of Esperanza, on 156th Street. He knew that the odds were stacked against him: His high school guidance counselors told him he would never make it in music and should set his sights on a blue collar job. But Núñez found that his pianistic skills brought him into contact with kids from other neighborhoods, including some from wealthy families, and that as a polished pianist who had a way with Chopin, as well as Latin merengue, he was able to command their respect. It took Núñez a while to find that mission. After studying electrical engineering at Manhattan College, he enrolled at New York University to continue his piano studies. Shortly before his graduation, in 1988, one of his teachers suggested that he do a semester of student teaching. Recognizing that the experience might be valuable, he took a position at the Third Street Music School, where his students were mostly Asian and Latino. “I was overwhelmed,” he recalled. “I said, ‘this is me!’ And they loved music. 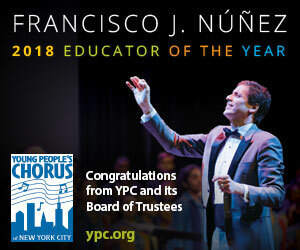 That’s what clicked.” From there, Núñez took a job at the Children’s Aid Society, where he established the basis of the Young People’s Chorus, with young singers from neighborhoods all over New York. To further his goal of molding his young charges into great people, rather than just great choristers, Núñez built his organization—which quickly separated from the Children’s Aid Society—to provide chorus members with a grand slate of non-musical extras, including tutoring in difficult subjects (chemistry and physics, for example), preparation for standardized tests (like the SATs), and workshops in skills like time management. Núñez says that 100 percent of the choir’s members continue their education past high school. His experience creating a choir with an educational wrap-around program and a unifying social agenda has made Núñez a celebrity in education circles. He has lectured around the world on his choir and its mission, and his work won him a MacArthur Foundation fellowship—the so-called “genius” award. Almost as a side benefit, he has transformed his choir from a modest community group into a top-drawer ensemble that has toured Europe and Asia, and has won a number of prestigious international prizes, including the top prize at the European Broadcasting Union’s “Let the Peoples Sing” competition in 2015, an award never before given to an American chorus. For Núñez, the future promises further growth. He expects the Young People’s Chorus of New York to have 2,000 members by 2020. And he has been traveling the country, helping to launch affiliate programs in other cities—among them, so far, Tenafly, New Jersey, Austin, Texas, and Minneapolis-St. Paul, Minnesota. Allan Kozinn, for many years a music critic for the New York Times, now lives in Portland, Maine, and writes about music and musicians for the Wall Street Journal, Opera News, and other publications.